I love this. A real feeling of space. Not sure I'd like to go up in one though.. I think nothing can pay the free sensation of flight. 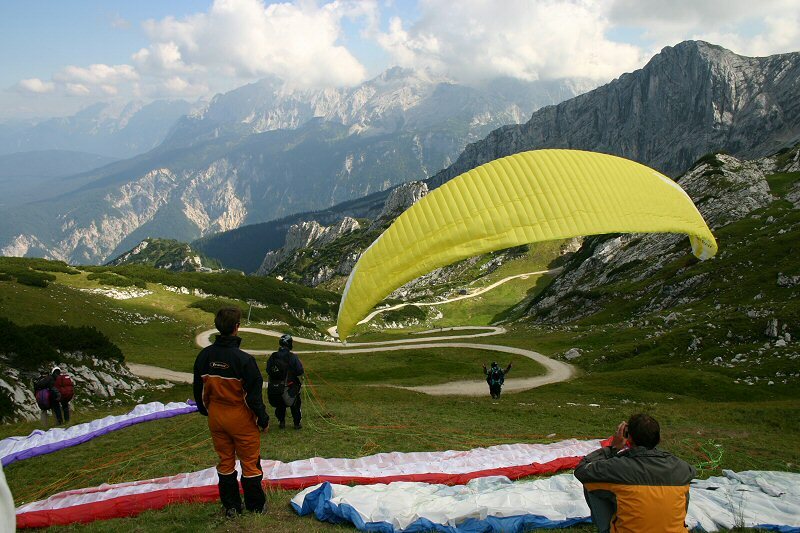 I have personally done something with "deltawings" some years ago, and I should like to try paragliding, also if i don't know difficulties about...Good image! Ha, let's prepare for a flight into free air! Run and jump! Wheeeeeeeee! Excellent shot, love it! *gasp* OMG, I'm breathing hard I'm SO excited!!!! I think this is the most exciting image I've EVER seen!!! *jumps up and down* *running* I feel like I'm actually in the sky lifting off!! Wheeeeee!!!! I hereby make a solemn vow...I WILL do this at LEAST once in my lifetime...for REAL...not just in my imagination!!! I don't know when. I don't know where! But nothing or no one will stop me from fulfilling this dream!!!! Thank you for fabulous image that brings me much happiness!!!!!!!!!!! Vote & into favs!